WhatsApp uses push notifications to alert you of new messages. For this to work, it must only run in the background but also have access to background data. When the internet connectivity on your Android phone is poor or down WhatsApp may not be able to check for new messages in the background. In other words, it senses that you may have new messages but due to the current network conditions cannot ascertain that fact. 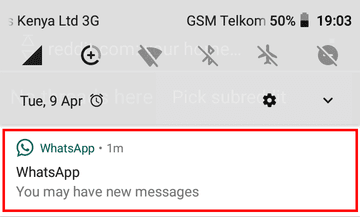 To handle this failure on its part, it pushes the "You may have new messages" notification as a kind of "polite reminder" for you to bring the app in the foreground (i.e. open the app) and confirm manually if any new messages have arrived. Usually before this, WhatsApp shows the other equally annoying "Checking for new messages" notification which often disappears on its own but may hang around if the network issue does not resolve before turning into this other notification. This failure however is not necessarily due to an external network issue. It could also emanate from the Android OS when as users we either disable background data or activate the Data Saver option. 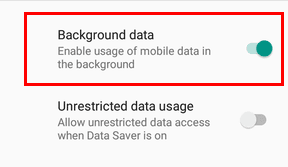 These two features actively stop background apps from using data in the background. As such, though WhatsApp is running and mobile data is turned on, it may not be able to access the internet. It's only recourse is therefore to throw this notification as a guess since I suspect it can’t tell the difference when a poor network is to blame and when its network rights are being micromanaged by the OS. Either way this is mighty annoying as the notification suggestion of there being new messages is often incorrect. Worse it may pop up a few moments later and is sure to do so on future occasions. The only way out here is to disable it for good or at least curtail where that's not possible. Here a couple of different ways to do that. In Android 8.0 (Oreo) and later it's possible to turn on and off specific notifications for apps. 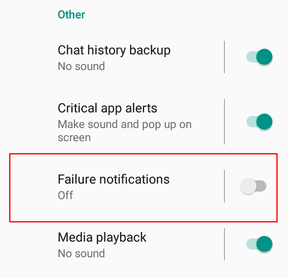 In the case of WhatsApp, this means you can turn off this particular notification without affecting its normal notifications. Alternatively, you can long press the notification when it pop ups then disable it right there in the notification panel. On Android 7.0 (Nougat) and 6.0 (Marshmallow) you cannot disable notifications based on categories. 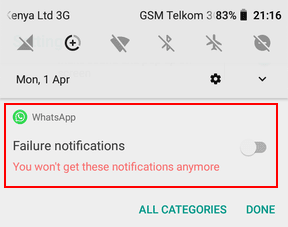 You'll therefore be forced to block all notifications for WhatsApp to disable this specific notification. Your first option here is to just disable the Data Saver. However, it's obvious that you've turned on this setting purposefully to cut down on your mobile data usage and thus turning it off completely won't make sense. 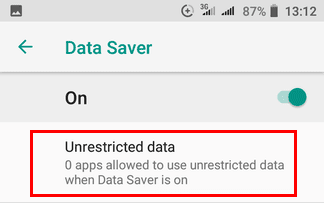 Fortunately, you can adjust the Data Saver settings to give only WhatsApp access to background data while restricting other apps. 1. Go to Network & Internet settings > Data Usage > Data Saver. You can also open the Data Saver settings by long pressing its toggle in the Quick settings panel then select Data Saver. On Android 7.0 and later you can toggle background data for individual apps. 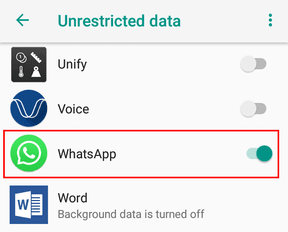 Ensure that WhatsApp is not restricted to access background data by going to: Settings > App & notifications > WhatsApp > Data usage > Background data. Note: When disabled, this setting overrides Data Saver's Unrestricted data usage option. On Android 6.0 and below the restrict background data setting is system wide and thus applies to all apps. You'll therefore have to turn it off if you want WhatsApp to access data in the background.